Ever wish you could roll your RV into an area where you could explore everything within only a few miles? Mountains, ocean, lakes, ocean beaches, plus one-of-a-kind events? Where you could stay in a friendly park and take day trips in temperate summer weather? If you have, then plan your next destination to the furthest northwest corner of the contiguous U.S. states: the Olympic Peninsula! And plan to make Evergreen Coho SKP Park your home base while you are here! We’d love for you to join us and experience the wonders of this area, and we welcome you to settle in at the Evergreen Coho SKP Park for a week or more where you’ll find all kinds of sights to see and things to do within an easy drive. Many are well publicized and some are lessor-known favorite treasures. Stay at Evergreen Coho SKP Park and you can just make fun day trips. NOTE: Each is listed with the approximate time to drive from Evergreen Coho SKP RV Park to each location. A spectacular view awaits visitors at Hurricane Ridge, the crown jewel of the Olympic Mountains. At an elevation of 5,242 feet, Hurricane Ridge offers visitors year-round pleasure. Enjoy summer hikes and photography of the surrounding mountain peaks and the abundant wildlife or walk the easy and paved Hurricane Hill Trail west from the Hurricane Ridge Visitor Center. Are you more adventurous? There are several dirt trails of varying distances and difficulty levels as well. The Hurricane Ridge Visitor Center offers trail maps, great exhibits of the topography and wildlife, stunning views from their picture windows (great in cold months! ), plus an information desk, gift-shop, restrooms, and snack bar. The weather in the Olympic Mountains is a bit unpredictable (Hurricane Ridge is named that for a reason! ), so check the weather report before you head out. And take a jacket and boots, just in case, at any time of year. Click here for Hurricane Ridge information. Numerous towns around Puget Sound offer various cruises with whale watching trips a tourist favorite. But the Port Townsend Marine Science Center offers some special ones like Bird Migration Cruises and Puffin Cruises, as well as Protection Island Cruises aboard the 101' historic schooner, Adventuress. Summers get busy, so call ahead to sign up. Eagle overlooks the Dungeness Spit. This U.S. Fish and Wildlife Service wildlife refuge consists of 636 acres, including one of the world's longest natural sand spits (five and a half miles long), tidelands and bay, and a small forested upland area. Its natural sand spit softens the rough waves of the Strait of Juan de Fuca to form a quiet bay and harbor, gravel beaches, and tide flats. Adventurous? Take the 10 mile round trip hike to the New Dungeness Lighthouse, which stands guard over the entrance to Sequim Bay, but allow about 5 hours to complete it. Or just bring your camera for a short hike from the parking area to the beach. In 1915 this unique area was declared a national wildlife refuge because of the over 250 bird species that you find here, making it a beach hiker and bird-watcher's paradise. A small entry fee is charged by the U.S. Fish and Wildlife Service. Clallam County offers the Dungeness Recreation Area campground with 64 campsites in the forested area just above the spit on a first-come-first-served basis. Port Townsend Ferry passing Mount Baker in the background. A great way to enjoy a summer day and you can get to the ferry in about 10 minutes forum our park. Historic Fort Worden, now a Washington State Park. Fort Worden State Park is a 434-acre multi-use park with over two miles of saltwater shoreline, two campgrounds and a wide variety of services and facilities. Over 100 buildings from the early 1900s remain on the fort, which house four museums, a gift shop, theater, various businesses and provide convention center facilities. 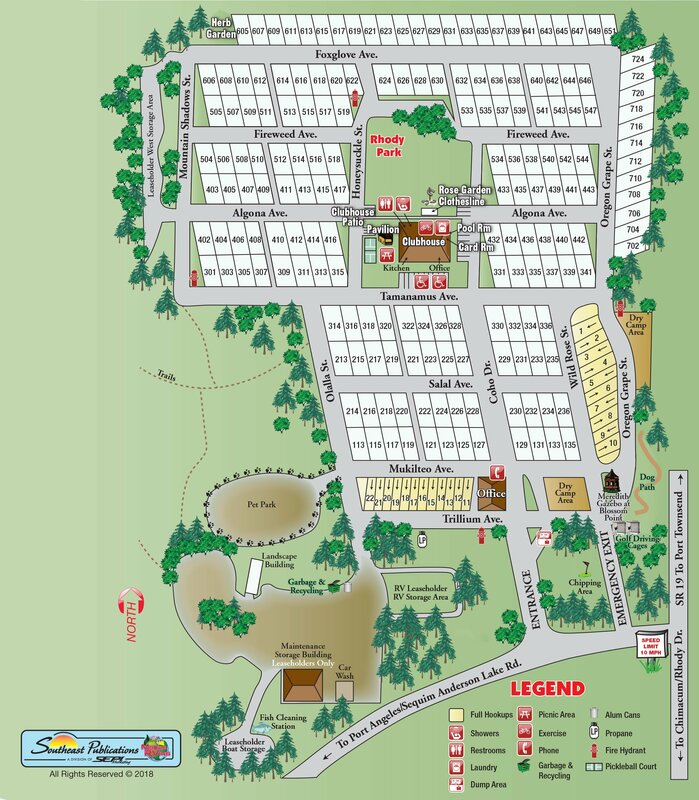 The 80 campsites are generous in size and most are level. The upper campground, in a forested area, includes water, electricity, and a sewer dump station nearby with easy access to over 6-1/2 miles of trails up to Artillery Hill where you can see the Strait of Juan de Fuca from the massive concrete gun emplacements tucked into the bluff. The beach campground is tucked between the bluffs and the beaches of Point Wilson with full-service hookup sites and new restrooms with showers. Reservations are highly recommended or, again, stay at the Evergreen Coho SKP Park and drive there in minutes to spend the day at museums, hiking or on the beach! A world renowned glass artist, Dale Chihuly greatly influenced the Studio Glass movement through his personal artistry and then in 1992 he helped to found the Museum of Glass in Tacoma where artists from around the world can study, perfect their art and display their creative talents. Spend a few hours here gawking at the marvelous art glass exhibitions in the galleries, the art installations on the outdoor plazas, and the hands-on art studio. Or watch artists create art from molten glass in the Hot Shop Amphitheater, located inside the 90-foot tall steel cone. Neah Bay, on highway 112, the westernmost point reachable by car in Washington state, is home to the Makah tribe and its annual, last weekend in August, Makah Days. If you can’t make that weekend, the drive will still offer great scenery and end with an impressive visit at the Makah Indian tribe’s extensive and impressive cultural center and gift shop. Their Makah Museum interprets and houses 300-500 year old artifacts recovered from the Ozette Archaeological Site. Initiated in 2013 and planned for Labor Day weekend in 2014, you’ll find this event filled with excitement but in a casual and up-close-and-personal atmosphere that makes this a relaxing and fun event. Even in their first year the events included hot air balloons, wing-walkers, aerobatics, RC planes, vendors, an antique car display and great food and music. Now in its 38th year, Port Townsend’s Wooden Boat Festival, held the first weekend in September, is an education-packed thrill for all wooden boat enthusiasts. It features more than 300 wooden vessels (most welcoming visitors for onboard viewing), plus dozens of indoor and outdoor presentations and demonstrations about the latest innovations in boatbuilding, equipment, skills, and adventure. The place is packed, so plan on parking at the designated park-and-ride and catching the free shuttle bus to the events. Held the first weekend in October, this fun-filled, totally whacky race held in Port Townsend uses a generous portion of adventure, mixed with garage engineering and creative artistic license to create Kinetic Sculptures which are functional works of engineering art. Their designs vary from simple one-person contraptions, to high tech, multi-pilot marvels with lengths of over seventy-five feet! Then they race on a course consisting of many terrain types from paved roads and sticky quagmires of mud to a stint within the choppy waters of the bay. Awards are given for numerous categories, including, Least Time, Most Time, Mediocrity, Krazy Koncept, and Artsy Fartsy. Everyone laughs, everyone has fun at this one-of-a-kind event. Click here for details on this unique race! These are just a few places and things for you to explore and enjoy while visiting us like: Port Townsend Rhododendron Festival, Sequim’s Lavender Festival to The Olympic Music Festival and so much more, there are still many other things to see and do on the Olympic Peninsula. So pull out your map and chart your course for a trip exploring the known and lessor known treasures of the Olympic Peninsula. Evergreen Coho SKP Park looks forward to being your home base while you enjoy our special corner of our marvelous country! We’ll look forward to greeting you and provide you with any additional information you need to make this the perfect destination spot for your RVing!